We all want to eat healthy and build up our bodies while hitting all the points on the food period, but how do we factor our budget into all of this? Fortunately, there are plenty things that we can do, and plenty of delicious foods to pick from eating healthy on a budget. Remember, not all great things have to be expensive! Isn’t it frustrating to go to the grocery store to see that organic is always the more expensive option? Or how a box of oatmeal is 2 to 3 dollars more than some sugar-laced cereals? Carbohydrates: Whole grain pasta, brown rice, oats, potatoes, beans, apples, bananas, whole wheat bread, sweet potatoes, etc. Proteins: Ground beef, chicken breast, tuna cans, cottage cheese, plain yogurt, eggs, milk, whey, etc. Fats: Olive oil, fish oil, flax seeds, real butter, nut butter, various nuts, etc. Cheap Protein: We all need protein in our diets to build healthy muscles, so how do we pick out the best kind? The solution would be to find a whole protein that will help with overall fat loss and have a high thermic effect. Consider these options: eggs, milk, whey, tuna, frozen chicken breast, cottage cheese, or mackerel. Steer clear of lunch meats or hot dogs even though they are cheap! Fruits and Vegetables: You might be tempted to buy frozen fruits and vegetables, but these usually take away the nutritious value. Aim to buy fruits and vegetables that are in season at the moment, or visit a local farmer’s market for cheaper and organic produce options. Generic: Generic options might not always be the ones bouncing out on the shelves, but they are the cheapest and usually do not taste much different than the popular brands. Also, consider buying store brands. For instance: rice, paste, eggs, milk, yogurt, or cheese can all be purchased in their generic brand form. At the end of the day, you are saving money that is spent on packaging and advertising the product. If you are trying to build muscle, consider a Whey protein, which will pack in 24g of protein per 30/g serving. Fish oils pack in health benefits and offer 1600mg of Omega-3 fatty acids a day if you do not regularly eat fish. Multi vitamins can help those who might be vegetarian and will contain about 100 servings of vitamins that can last you up to 6 weeks. Bulk: Ever been to Costco? Buying in bulk is great for foods like pasta, rice, or oats that you can store for a long time. If you do not have a wholesale food store, buy in bulk at the grocery store during sales. Here are some other bulking ideas: Beef, supplements, frozen fruits that can be used for nutritional morning smoothies. Calorie Dense: A great way to make sure that you are meeting your daily caloric needs in the most efficient and cheapest way possible is to buy calorie rich foods that are filling, healthy, and cheap. A few examples of these are: whole wheat pasta and rice, oats, peanut butter or other nut butters, and bananas. Discounts: Look for discounted items around your grocery store that are healthy as well. For instance, you can probably spot some discounted meats the sooner they reach their expiration dates. Farmers Markets: Farmer’s markets or local farms are great places to get healthy and good quality tasting foods. A bonus perk is the samples that they usually offer at their booths! Plus, you will know that everything is grown locally and organically. 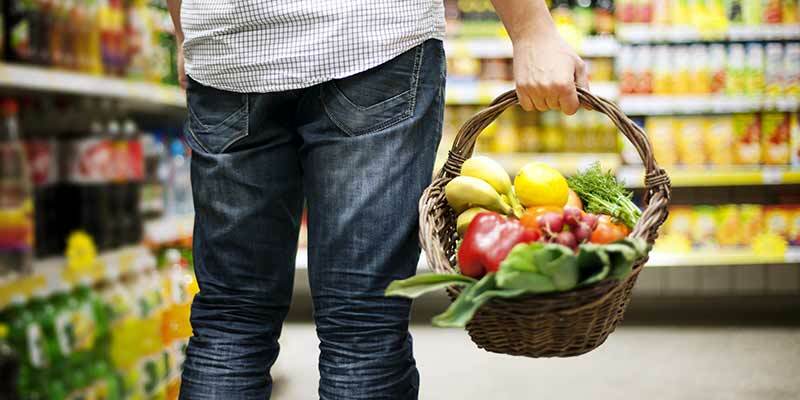 Shop Smart: Consolidating your shopping to one grocery store is the more efficient way to save time, gas, and money. Try to avoid driving around to different places for something you need. Tap Water: Buying a water filter is much cheaper and healthier than buying bottled water at the grocery store or convenience store. One $8 filter can usually last for about 40 gallons of water. Coupon: We are not suggesting that you become a crazy coupon lady, but clipping coupons is a great way to save money in just a few snips! Look online or pick up your Sunday paper. Customer Card: Groceries generally have a customer card available for shopper where they can rack up points each time they go into the store. Unit Price: To avoid getting ripped off by bulk items, you might want to consider checking the unit price to see how big the servings actually are. Sometimes two smaller boxes are cheaper than one large one – it just depends on the packaging! Eat less: This might seem like a silly way to save money, but if you are looking to lose some weight or fat around the edges, consider consuming fewer calories. Not only will you be healthier and feel better about yourself, but you will be saving money in the process. Impulse Buying: Don’t do it! Another tip is to not go to the grocery store when you are hungry. The smartest way to avoid buying things you do not need is to have a plan before you step into the store. Make lists, eat before you shop, and shop alone. Avoid Eating Out: Although it might be tempting to go out for lunch at work or give your kids lunch money instead of packing a lunch, preparing your own food is healthier and cheaper in the long run. If you are taking a meal to work, buy some containers or plastic baggies that you can easily store your food in. If you have children, brown-bag their lunch on a daily basis so that it becomes a regular occurrence to them. However, to make bringing lunch fun, pack a yummy treat or include a note to make lunch seem more personalized. Another great tip is that, if you plan on doing errands out most of the day, or plan on being away from home for a few hours — eat a nutritious sand sustainable meal before heading out. Cook Ahead of Time: Sometimes you might be too exhausted or hungry to spend time cooking, which will lead you to the closest drive through. The keep this from happening, cook your meals the day before, or get started on dinner earlier in the day. There are plenty of recipes online that you can check out for some tasty and healthy ideas! Grow: Growing your own food is not just for farmers! If you have a backyard handy, or even a few empty pots, you can plant your own produce and vegetables to help you stay in control of what you eat. You will probably also grow a good amount that will last you for a few servings. Want some more ideas for eating healthy on a budget? Here are some healthy foods that you can try out that are delicious and nutritious – all under $2! Brown Rice: About $1.75 per pound. Can be used as a side, for fried rice, soups, strew, and casseroles. Whole-wheat pasta: About $1.69 for a 13 or 16 ounce bag. Can be used for hot or cold pasta dishes and soups. Greek Yogurt: About $.89 for 6 to 8 ounces. Can be used as a snack, in parfaits, or in smoothies. Oats: About $3.99 for a 42 ounce container. Can be used in hot or cold cereals, for granola, crumb toppings, or baked goodies. Potatoes: About $.33 per potato. Can be eaten as a baked potato, a breakfast item, in a salad, or with casseroles or stews. Spinach: About $.33 for a 2 cup serving. Can be used in salads, egg dishes, sides, soups, and stews. Beans: About $1.19 for a 15 ounce can. Can be used for burritos, nachos, dips, or as a side protein. Tuna: About $.70 per can. Can be eaten in sandwiches, salads, with crackers, or in casseroles. Pita Bread: About $3.29 for a 12 count package. Can be used for sandwiches, pizzas, flatbreads, or with appetizers. Eggs: About $1.99 for a carton. Can be eaten boiled, fried, as an omelet, in fried rice, and in many other baked or cooked main dishes. Lentils: About $1.29 for 16 ounces. Be used in stews, salads, or soups.